Preheat oven to 350º F. Melt the candy bars in a pan with 1/4 cup of butter. Let it cool while you sift the dry ingredients into a bowl. Cream the rest of the butter, add the sugar, and beat until fluffy. Add in the eggs one at a time, then add the melted candy mix into that. Combine the vanilla and buttermilk. Add 1/4 of the flour mix and 1/4 of the buttermilk mix to the main mix, and mix it in. Keep alternating until all your materials are combined, and finally add in the pecans if you're using them. 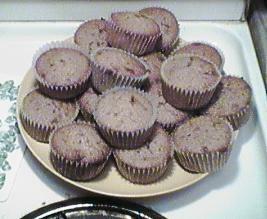 Pour into cupcake tins and bake for 15-20 minutes. Cool for 10 minutes in pans, then on a rack.